Photo: Rowan Oak (William Faulkner House), ca. 1844, Old Taylor Road, Oxford, MS. 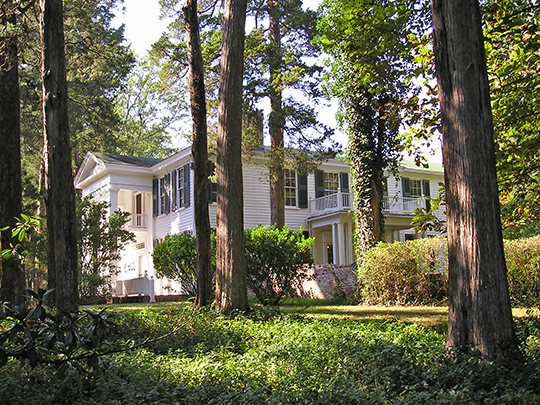 Listed on the National Register of Historic Places as a National Historic Landmark in 1968. Photographed by user: Wescbell (own work), 2010, [cc-by-3.0 (creativecommons.org/licenses/by/3.0)], via Wikimedia Commons, accessed October, 2012. The Lafayette County Courthouse is located at 1 Courthouse Square, Oxford, MS 38655; phone: 662-234-3013. The county was created in 1836 and named for the Marquis de Lafayette. The county seat, Oxford, is home to the University of Mississippi, chartered in 1844 and opened to students in 1848.